Once again the trail adjacent to Wiehle Ave, between the Dulles Toll Road and Sunrise Valley Dr, is closed. There is no detour. What message does this closure send to pedestrians and bicyclists? Go away; we can't be bothered to provide an alternate route for you to safely cross the Dulles Toll Road. There is no trail or sidewalk on the other side of Wiehle Ave. At least cyclists can ride in the road, although only the most confident are willing to ride on Wiehle Ave across the Toll Road bridge that at one point has 6 lanes in the northbound direction. When this trail was last closed, we were told that there were no other options. The last time I looked there were several lanes of asphalt adjacent to the trial. Couldn't a couple of feet of that roadway be used for providing a place to safety walk and bike while work is being done? The closest alternative routes, either to the west on Reston Parkway or the east on the W&OD Trail, are about a three mile trip. Instead, pedestrians and some cyclists will ignore the trail closed signs. Since there is no construction underway now, the day before the Thanksgiving holiday weekend, the route is passable. Once construction begins it likely be dangerous but without a viable option, most people will use the trail any way. Nearby there is construction at the Sunset Hiils Rd/Wiehle Ave intersection. The sidewalk/trail on the southwest corner was torn up and now there is a large mud hole. The other corners aren't much better. Pedestrians pass through this intersection all the time. There is a well-used bus stop nearby along with offices, and fast food places. The current construction is being done to facilitate people getting to the station. It's yet to be seen if after the construction these locations will be any better for pedestrians and bicyclists. They are to be avoided now, but some people can't avoid them; they don't have any viable options, and detours need to be provided. The rail station will be open soon. There will be much more pedestrian and bicycle traffic in the future at these locations, and construction related to redevelopment around the stations will be underway over the next several years. Fairfax County, VDOT, and WMATA all need to do a better job of providing temporary access for pedestrians and bicyclists during construction. Those agencies wouldn't close a road or a rail line without providing a safe alternative. The same needs to be done for trails and sidewalks. Update: Thanks to help from VDOT staff, the trail is now open. There was some temporary trail work that was becoming unstable which caused the trail to be closed. After VDOT was contacted about the problem, they quickly worked with field staff to make the necessary repairs and re-open the trail. We'll check it out tomorrow. Thanks VDOT for your rapid response! Update2: We checked out the trail and one of the Sidewalk Closed signs had been removed but the other one was still in place. It didn't appear that any repairs had been done; someone likely just went out and moved the Sidewalk Closed sign to the side. I'm glad the trail is open, but am disappointed that it was closed with no notice and for no apparent reason. The work was likely being done by contractors for the Wiehle-Reston East station. Here's an idea: When a construction sign is placed on a site, especially a Trail or Sidewalk Closed sign, there should be contact information for whomever is dong the work. As it is, it's usually a mystery as to who is involved with work at construction sites. We just received some great news from Randy Dittberner, Regional Traffic Engineer with VDOT, regarding new bike lanes installed today as part of a road diet project on River Birch Road located just west of Centreville Rd and just south of the Dulles Toll Road. See our earlier blog post about this project. This is the third road diet in the county that has resulted in new bike lanes being installed. The others are Lawyers Road and Soapstone Drive, both in Reston. They are all examples of how we can make better use of our existing roads to provide space for bicyclists. There are many similar roads throughout the county. We hope that the success of these projects leads to more bike lanes in the future. VDOT’s latest road diet was implemented today, on River Birch Road between Dulles Technology Dr. and Sunrise Valley Dr. The project took away a through lane in each direction in favor of bike lanes and on-street parallel parking. Over the years the adjacent community has repeatedly requested additional parking because of a shortage of off-street parking, and the project helps address the shortfall. The reduction of a travel lane also will help control speeding, improve safety, and improve cyclist accommodations. River Birch carries at most about 4,000 vehicles per day, an amount of traffic that can be easily accommodated in a single travel lane. The entire 0.7-mile length of the street was treated. The project was tailored to accommodate the needs of Coates Elementary School, where a queue of vehicles forms daily to enter the kiss-and-ride lot. 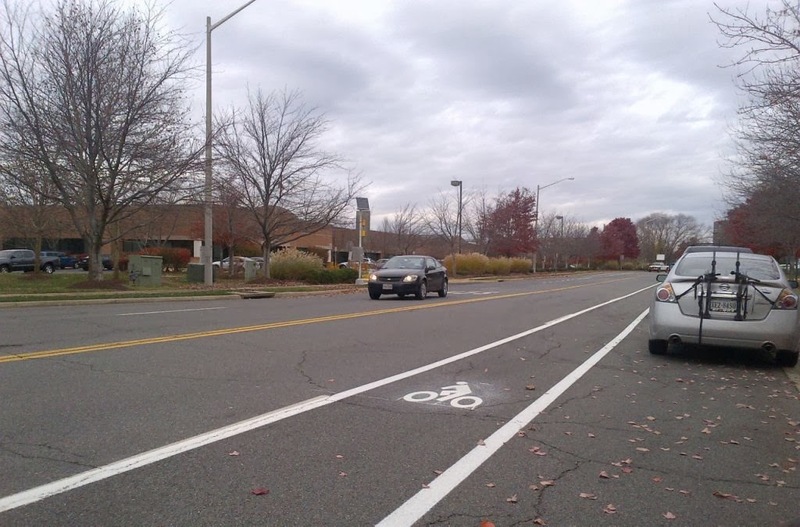 The parking and southbound bike lane were discontinued for about 500’ in this queuing area, and shared-lane markings were installed to bridge the gap in the bike lane. The number and configuration of approach lanes were maintained at the stop signs at each end and the middle of the street. The project was implemented after VDOT and Supervisor Foust held a community meeting on October 2, at which residents showed overwhelming support for the proposed change. This is VDOT’s first road diet that was installed as a stand-alone project, rather than in conjunction with roadway repaving. As such, the project was configured so it did not require any changes to the existing centerline and very little eradication of existing markings. A few photos of the finished project are attached. Many thanks to Ivan Horodyskyj for managing the project, to Bobby Mangalath for preparing the in-house pavement marking plan, Lew Graef for fine-tuning the signs, and to VDOT’s pavement marking and sign crews for their quick action to get the project implemented before winter weather sets in. Today is the last day to fill out the Countywide Dialogue on Transportation survey to vote on unfunded projects to help the county prioritize their projects list. We've selected a list of bike projects contained in the larger project category "Pedestrian/Bicycle." Bike projects are relatively inexpensive compared to some of the very expensive road projects. The funding needed to build a first class connected bicycle network is comparable to just one of the major intersection or roadway widening projects. We think that all bicycle projects should be integrated with the proposed transit, intersection, roadway widening, roadway extensions, and spot improvements. The bicycle facilities included in some of the major road projects may need to be extended to connect to an existing facility. That connection should be part of the project design. During construction of the roadway projects, safe bicycle access needs to be provided throughout all phases of the project. We are developing a FABB position on the projects and the process for selecting them that we will send to the Board of Supervisors and present at the public hearings. See our earlier blog posts about this process. 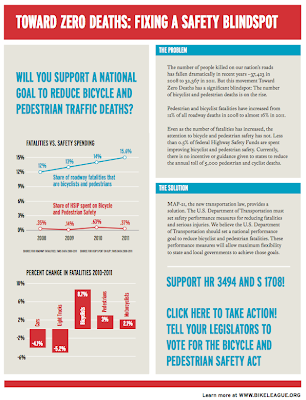 A coalition of bipartisan lawmakers in the House and Senate introduced identical bills (HR 3494 and S 1708) -- the Bicycle and Pedestrian Safety Act -- to help reduce the number of bicycle and pedestrian fatalities on American roadways. Here is League President Andy Clarke's statement on the legislation. Dramatically reducing the number of people biking and walking who are killed and seriously injured on our roadways is critical for two very compelling reasons. First, this is about much more than just statistics - every one of these fatal crashes robs a family, a community and our nation of a precious human life. The costs to society are huge, and these are usually very preventable crashes. Second, bicycling and walking are healthy and enjoyable ways to get around that we should be doing everything possible to promote: we know that lack of safety is a major deterrent to people walking and riding more frequently, and we know exactly what we can do to improve traffic safety - not just for people riding bikes and walking but for everyone on our roads. Establishing simple safety performance measures - holding ourselves accountable to eliminate these needless crashes - will prioritize roadway designs that are safe for all users, and encourage education and enforcement programs that rid our communities of the scourge of distracted driving, speeding, and drunk/drugged/drowsy driving. That's good for everybody. Bicyclists and pedestrians make up an increasingly large percentage of all roadway fatalities and serious injuries - and in a handful of states the issue is particularly acute. States such as Florida, California, New York and Texas need the backing of the Federal government to tackle this problem head-on, and every State in the nation can play a role in making biking safer and encouraging more people to ride. Use the League's Take Action page to contact your Congressional representatives and ask them to co-sponsor HR 3494/S 1708 to institute a nonmotorized safety performance measure. Implementation of the bicycle master plan. Bicycle paths provide healthy and effective options to move about the county and between connected destinations. 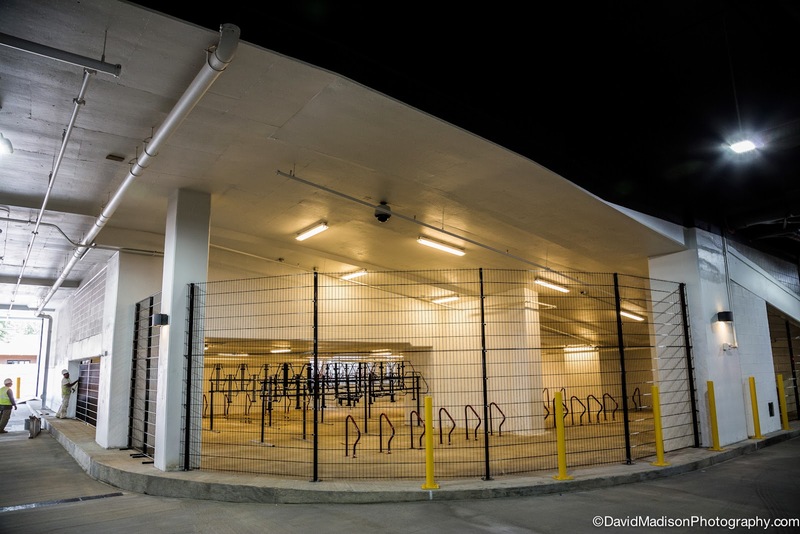 Expanded bicycle parking guidelines modeled on successful programs such as the new secure bicycle parking facilities at Silver Line stations and other county park-and-ride/transit facilities. Funding for implementation of both capital and non-capital elements of the county’s bicycle master plan. Engagement of the private sector. One example of this can be seen in New York City, where CitiBank underwrites 100 percent of the cost of a bikeshare program. This could work today in several suburban and transit centers. Fairfax Advocates for Better Bicycling is focusing on the need for good bicycle infrastructure in mixed-use, transit-oriented developments. The county is going through a difficult transition, in that it is promoting this type of development in the context of big suburban roads. A prime example is the Mosaic District surrounded by Lee Highway and Gallows Road. Both of these roads are not friendly for pedestrians or bikes. http://www.fabb-bikes.org. An example of decision making can be seen in the designation of urban street standards and applying them in county urban centers. EQAC supported such a principle in a formal memo earlier in 2013 (see Appendix B of this report). Overall, the community has been advocating for a series of improvements that include narrower lanes, pedestrian/bicycle paths on either side of the road, tree buffers between the street and path, reduced speed limits and safe crossings. The county has had success using road diets, which slim down roads to make them more appropriate for urban traffic. These were implemented on Lawyers Road in Reston. The Virginia Department of Rail and Public Transportation has developed statewide guidelines for multi-modal planning and design at the regional, community and corridor scales.18 The guidelines are now in final draft form and can be downloaded from DRPT’s website at: www.drpt.virginia.gov/activities/MultimodalSystemDesignGuidelines.aspx. Fairfax County staff has been meeting with VDOT and with DPRT for the past 13-14 months to develop formal urban street standards. VDOT created an appendix to its road design manual that will adopt state-wide urban design standards. Concurrently, DRPT is working towards adoption of its Multimodal System Design Guidelines. 19Transportation Information for EQAC 2013, Kris Morley-Nikfar, FCDOT & Updated June 8, 2011, Dan Southworth, FCDOT. Bike lawyer Bruce Deming to speak at FABB monthly meeting on Wed.
At the FABB monthly meeting on Wednesday Bike Lawyer Bruce Deming will discuss his book Surviving the Crash: Your Rights in a Bike Accident. He will also answer questions on cyclists' rights. The meeting is at 7:30pm at Patrick Henry Library in Vienna. We'll also get an overview of bike activities in the county by the county bike coordinator. 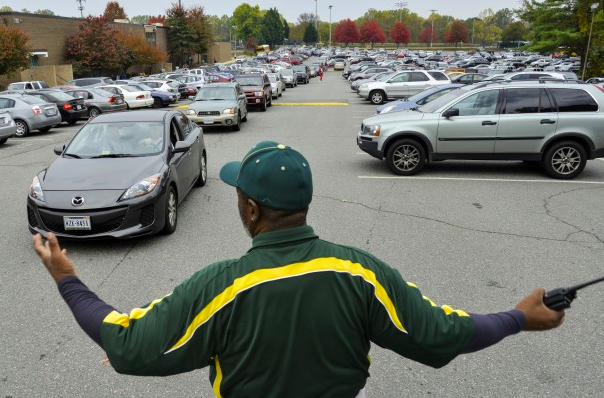 Do Fairfax Co high school principals want students to drive to school more often? 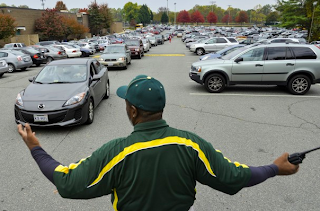 In an article about economic disparity between high schools in Fairfax County there is a discussion of how student parking fees are used to pay for needed school supplies. These fees are used at the discretion of principals to pay for computers and other supplies. Unfortuntaely there is an incentive to encourage more kids to drive to school so schools can collect parking fees. Langley High School in McLean collected over $13,000 last year. Mt Vernon High School collected only $465. Most of the students who drive either could take the bus or live within a mile of the school and could walk or bike. It's unfortunate that principals are basically encouraging more kids to drive to their schools, contributing to local traffic congestion and air pollution, so they can collect funds from those students. Wealthier schools, with students whose families can afford cars and the fees, sell out their parking spaces. At some schools, parking spots are in such high demand that dozens of students sign up for waiting lists or park in overflow lots. At James Madison High School in Vienna, students who miss out on a school space can pay to park at a nearby Elks lodge. Administrators at Langley High School in McLean, where about 2 percent of the students qualify for free or reduced-price meals, said that the school earned $13,890 last year in parking fees. Poorer schools sell virtually no spots, according to data obtained by The Washington Post. Mount Vernon earned $465 in parking revenue last year — less than the cost of one new iPad Air. Joan Daly, president of the Falls Church High School Parent, Teacher, Student Association, said it is unfortunate that schools with a higher ratio of poor students take the biggest hit. At Falls Church, where 57 percent of the students qualify for subsidized meals, the administration sold 68 of 120 parking spaces as of Oct. 15. Because some of the spaces are subsidized, the parking fees brought in about $1,600 to the school. Navigating stairs with a bicycle is a challenge. One solution that I've seen used extensively in Europe is a stair channel, a narrow ramp adjacent to the stairs that allows cyclists to walk their bike up or down the stairs. WMATA recently installed a stair channel at the Glenmont Metrorail station. The first stair channel was installed a the Rhode Island station. See the video below for a demonstration of how it works. Thanks to the efforts of FABB member Dennis Frew and support from the McLean Chamber of Commerce and Dranesville District Supervisor Foust, new bike racks are popping up around downtown McLean. Several of us from FABB attended the ribbon-cutting ceremony yesterday to celebrate the installation of racks near Greenberry's Coffee. Greenberry's hosted the event which was attended by Supervisor Foust, Chamber of Commerce members, county staff, Virginia Delegates Comstock and Keam, WABA suburban outreach staff, and FABB. Virginia Senator Favola stopped by briefly after the event. 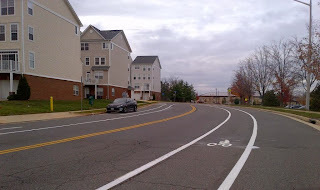 McLean is leading the way for better bicycling in Fairfax. Wayfinding signs were installed this summer throughout McLean and now they have a bike parking initiative. Why not support their efforts by riding to McLean or stopping by Greenberry's and saying thanks? You could also take the McLean neighborhood tour that Dennis has led in the past. Update: See Sun Gazette article New Bike Hitches Installed to Boost Cycling in McLean. McLean Patch article Cyclists Can Now Get 'Hitched' in McLean. If the $1.2 billion in new transportation funding were allocated according to comments at the Countywide Dialogue on Transportation meeting held last night in Reston, the majority would be spent on bicycle and pedestrian projects. Nineteen of the approximately 20 speakers wanted better bicycle and pedestrian conditions. The other speaker wanted to know when the Silver Line start date would be announced. There are over $3 billion in projects on the unfunded list. No one spoke out for new Interchanges ($1.2 billion) or Roadway Extensions ($790 million) or Roadway Spot Improvements ($128 million) or Roadway Widening ($1.7 billion). They want to be able to walk and bike safely in their communities. See the complete list of projects. The final Dialogue meeting is scheduled for Thursday, November 21 from 6:30 p.m. - 9:00 p.m. at Spring Hill Elementary School, 8201 Lewinsville Rd., McLean, VA 22102. Thank you for seeking our input and for providing clear information on the proposed projects in the form of maps and text that's readily accessible online. It's very useful. The new transportation funding is a once in a generation opportunity to solve some of our major transportation problems. With this funding we could create a first-class bicycle network around transit and Activity Centers to allow residents to take short trips by bike. While it's encouraging to see so many bicycle and pedestrian projects on the list, I'm concerned that the bike projects may not be the highest priority projects and that there are almost no on-road bike projects. Before finalizing the list of bicycle projects I suggest that we determine which projects will most readily accomplish these goals. A funding category could designated To Be Determined from Fairfax County Bicycle Master Plan. The final decisions on projects could be made once the Plan is finalized and the Bicycle Advisory Committee, a recommendation of the Plan, has had a chance to weigh in on the priorities. 2. The Bicycle Route Map shows existing bike routes in the county. On the map are several blue dashed lines showing critical on-road routes where connections are needed. The most dangerous of those routes are colored orange, warning cyclists to use extreme caution. I suggest we determine which projects will help fill those gaps. Examples of relatively low cost projects that will fix these dangerous connections include: Extending the Lawyers Rd bike lanes to Twin Branches and Reston Parkway, improving the FFX Co Pkwy crossings at Spring St, Rt 50, and others, and connecting the multiuse trail on Baron Cameron Ave. The Baron Cameron trail is complete between Fairfax Co Pkwy and Route 7 except for about 300 meters along two properties. This is an excellent opportunity to make major progress in making the county more bike-friendly and I think we should spend the time to ensure we are funding the right projects. 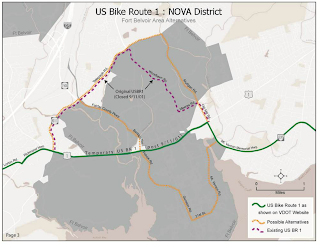 VDOT is conducting a study of possible alternatives to US Bike Route 1. They are taking comments on these alternatives. To see the various options and to provide comments, see the US Bike Route 1 Virtual Meeting presentation. The presentation includes maps of the existing route, the route as shown on the VDOT website, and possible alternatives. The route follows a key corridor through which several bike routes pass: US Bike Route 1, Adventure Cycling Atlantic Coast Route, East Coast Greenway, and Potomac Heritage National Scenic Trail. The official route was effectively closed when Woodlawn Road was closed after 9/11, and there are few good alternatives. If you are familiar with this area and want to weigh in on possible routes, visit the Virtual Meeting site and provide comments. US Bike Route 1 was established in 1982. 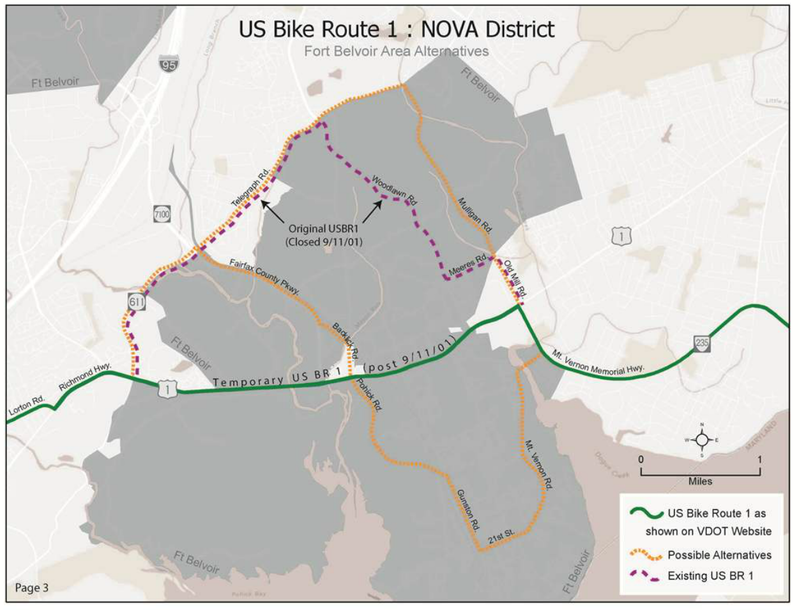 Due to new development in Northern Virginia, the current routing of USBR1 needs to be re-evaluated along with any possible alternatives. The project study area extends from the 14th Street Bridge in Arlington County to the southern boundary of Prince William County. This study includes conversations with jurisdictions, an on-road inspection, a Level of Service (LOS) analysis, a detailed signing plan and cost estimates for future implementation. 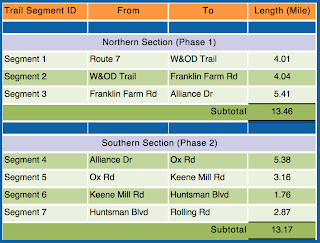 The following draft maps identify the current route as shown on VDOT's website, as well as several alternatives that are currently under consideration. Please share your thoughts on these routes via the electronic comment forms (found after each map). Your responses will be recorded as you go. Alternatively, you can email comments to: christopher.chop@mbakercorp.com. The deadline for comment is Monday, December 16th. Fairfax County Public Schools is hiring a Safe Routes to School Coordinator. The position description and qualifications are below. Please pass on this job announcement to help spread the word. We've heard that the position closes on Wed. FABB has advocated for this position for the past couple of years. FCPS received a grant for the position from the VDOT SRTS program in July. Organizes school division activities for Walk to School Day and Bike to School Day. Establishes and organizes a divisionwide program for regular walking school buses and bicycle trains. Creates templates and other materials for individual schools to customize. Creates materials, templates, or standards for individual school use for encouragement events such as Walk to School and Bike to School Day. Review and organizes safety education for student pedestrian and bicyclist safety. Conducts training, as appropriate. Creates materials for and organizes walk and bike audits of areas near schools. Coordinates with local transportation engineers and officials on needed infrastructure, especially to support individual schools. Supports and encourages SRTS network among participating schools in the division. Helps establish SRTS teams at schools within the division. Establishes standards and opportunities for stakeholder and volunteer participation in SRTS activities divisionwide or at each school. Coordinates completion of evaluation tactics such as student travel tallies (including participation in the Virginia Department of Transportation (VDOT)-sponsored Student Travel Tally Week), Parent Surveys, and reports to VDOT on divisionwide SRTS activities. Performs all necessary documentation and reporting to VDOT for SRTS grant requirements. Performs related work, as assigned or on own initiative. An endorsement to teach health and physical education within the Commonwealth of Virginia preferred. Interested applicants please fax resumes to Douglass O’Neill at 571-423-2017. Fairfax County is developing a list of transportation projects to be funded with over $1 billion. Several bike projects are contained in the list. This is your chance to find out what projects are planned for your area, and to speak out in support of funding for bike projects. Take the survey to vote on what you think are the most important bike projects and to give feedback to the county on how this money is being spent. See an earlier FABB blog post with links to project lists and more information. Tuesday, Nov. 12 at 7 p.m.
Wednesday, Nov. 13 at 7 p.m.
An enthusiastic crowd attended the second Fairfax Bike Summit on Saturday, Nov. 2. Over 160 people registered for the Summit and there were noticeably more people in attendance than last year. Thanks to everyone who took time out of their weekend to attend, and thanks to the volunteers who worked hard throughout the year to help make it happen. See our summary of the wrap-up session on the FABB blog. See the FABB Flickr pool for photos from the summit. Blog accounts of the summit were posed by Rootchopper and tinlizzieridesagain and Summit tweets are at #ffxbikesummit. During a briefing for the Fairfax Co Board of Supervisors on September 17 the county bike coordinator outlined a schedule for adoption of the Countywide Bicycle Master Plan. See the FABB blog post for more detailed information about the briefing, including key recommendations and a list of ways to jump start implementation. The plan is not yet available on the county website but FABB has posted the July 2012 Draft Bicycle Master Plan text and maps (see FABB homepage for map links). Major sections of the Fairfax County Parkway Trail are scheduled to be repaved over the next year. FABB members received a briefing at the September FABB meeting in which VDOT maintenance staff outlined the two phases of the work. Phase I is the north section from Route 7 to Alliance Dr (near VDOT HQ) and Phase II extends from Alliance Dr south to Rolling Rd. FABB has been working with VDOT to identify the areas of the trail most in need of repair. The majority of the trail is owned by VDOT. Some sections are owned by Fairfax County, which now needs to come up with $181,000 to supplement the VDOT funds for the repaving project. According to a Board Matter by Supervisor Herrity, "Various County agencies attempted to identify a source for this money but were unsuccessful." Supervisor Herrity has asked that the "Board direct the County Executive to use his best efforts to identify funding and report back to the Board on the outcome." VDOT has made a major commitment to this project and will repave their sections. The county needs to pay their share to ensure the work is not done in a piecemeal fashion. The local Northern Virginia Tour de Cure is held each year in Reston, starting from the Reston Town Center. The event is held on a Sunday in June. The 2014 event is June 1. The tour consists of rides of various lengths. The short ride follows the W&OD Trail to Vienna and back. This is usually one of the most crowded times on the Trail and the Vienna-Reston section is one of the most congested. As the Trail gets more congested, we're seeing more bad behavior: Cyclists passing others too close, too fast, and without warning; pedestrians and joggers wearing headphones; dogs on long leads; etc. Holding a major event on the Trail adds to the problem. We're working with the Tour organizers to see if there is a way to route the short ride somewhere besides the W&OD Trail. One option is to use the Fairfax Co Parkway Trail north to Dranesville Tavern and back, possibly using some of Reston's neighborhood streets. There are so many places in Fairfax to discover by bike, and yet almost everyone seems to want to ride on the W&OD Trail. We think organized rides, runs, and walks should be a way for participants to discover those places. Most participants likely have already ridden on the Trail; why add to the congestion by holding an event there. Do you want to ride for a great cause? Do you know someone with diabetes? Every 17 seconds someone is diagnosed with diabetes, for a total of 5,000 new cases each day. Every day 238 people living with diabetes undergo amputations, 120 enter end-stage kidney disease programs and 48 go blind. YOU can join the fight to stop diabetes by cycling in your local Tour de Cure! Register NOW and get $5 off by using promo code BIKE2014. Register today and take the ride of your life! 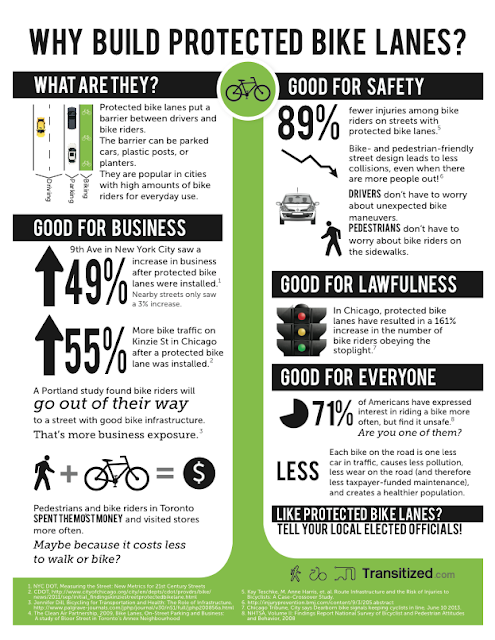 See this excellent infographic on the many benefits of having good bike infrastructure. From the blog Transitized. At their meeting on Oct. 29 the Fairfax County Board of Supervisors agreed to offer a reduced introductory rate for use of the Wiehle-Reston East Metrorail station bike room. The annual rate for use of the room is $75. The reduced rate will be $45 for the first year or $75 for the first two years. Fairfax County is maintaining a waiting list for rental of the room. To put your name on the list write to bicycleprograms@fairfaxcounty.gov. Once there is a system in place the county will begin selling memberships. Board approval of an introductory reduced rate for the bike room use/membership fee at the Wiehle-Reston East Metrorail Station. RECOMMENDATION:The County Executive recommends the Board approve an introductory, reduced rate for earlier subscribers applying for membership to use the new bike storage room at the Wiehle-Reston East Metrorail Station. BACKGROUND:The Reston-Wiehle East Metrorail Station will feature Fairfax County’s first enclosed, secure bicycle parking facility with a capacity for over 200 bicycles. In addition to secure fee parking, the facility will also provide unsecured (free) parking as well as area reserved for a future bikesharing station. On July 30, 2013, the Board of Supervisors approved various rates for the new Wiehle- Reston East Metrorail Station, including the bike room rates. An annual membership fee of $75.00 was established. This includes a one-time fee of $15.00 (non-refundable) for the access key fob. This rate is comparable to rates for similar programs provided by both the Virginia Department of Transportation (VDOT) and the Washington Metropolitan Area Transit Authority (WMATA). The Early Registration Two Year Bundle will provide an opportunity for early subscribers to purchase an additional year membership for only $30.00 more. Bicycle locker renters at Sunset Hills Park and Ride Lot must relocate because the lot is closing when Wiehle-Reston East Metrorail Station opens. Due to this inconvenience, these users will be offered the early registration price and their current annual locker rental fee balance will be applied toward the new bike room membership fee. The fee balance will be based on the opening date of the Wiehle-Reston East Metrorail Station bike room. Applications received on March 1, 2014, or later will be charged the full annual membership. We had hoped Fairfax County would offer an hourly rate similar to that used by WMATA at the College Park Bike & Ride facility. That options allows for occasional use of the room without a full year commitment. It also encourages overnight use by charging a lower rate from midnight to 8AM which allows commuters to leave their bike before catching the train to ride home, then retrieving it the next day. We still hope the county can eventually implement such a system that is compatible with WMATA's. Update: See Connection article Bicycle Access Coming to Wiehle Station: Bicycle racks, lockers, equipment part of alternative access options. Fairfax County is holding the second of four meetings to get feedback from the public on proposed transportation projects. The meeting is at 7pm at Falls Church High School, 7521 Jaguar Trail, Falls Church. The school is just inside the Beltway off Route 50. One of the proposed projects is a bridge over the Beltway just north of Route 50, an $8 million project. See a list of proposed bicycle projects and an earlier blog post about the meetings. Please consider attending this meeting and speaking out for better bike facilities. An enthusiastic crowd attended the second Fairfax Bike Summit on Saturday. Over 160 people registered for the Summit and there were noticeably more people in attendance than last year. Support FABB, WABA, Virginia Bicycling Federation, and the League of American Bicyclists who are working at all levels to create bicycle-friendly communities. Speak up for better bike facilities; if you don't ask, they won't get built. Fairfax County is seeing input on future transportation projects at a series of meetings this month. The next meeting is tonight at Falls Church High School. If you can't attend, take the online survey. See a list of unfunded bike projects being considered. Find out more about efforts to ensure that the county considers health impacts of transportation and other policies. See the Community Health Improvement Plan. It's not just about the bike; join others working to improve transit, livability, and walkability. Our focus internally is about improving bike conditions but externally we continue to stress the need for a multimodal system; we all benefit by having more transportation options. Normalize bicycling so everyone can see themselves riding for short trips. You don't need a special bike or clothes. Never accept poor quality facilities. We want quality infrastructure, not bare minimum bike lanes or trails. If we want people to feel safe while riding, we need better, safer facilities. Marketing is key to everything about Tysons and other new transit-oriented developments. It will be a major effort to change a culture of driving for most trips to one in which walking, biking, and transit are the norm. Part of building a world-class livable community is to actively encourage people to change how they get around. Compared to the amount of money being spent on infrastructure in Tysons, establishing encouragement programs is peanuts. Tomorrow is Election Day. Find out candidate positions on transportation and whether they support bicycling, and vote. Send another message by voting by bike. Thanks to everyone who took time out of their weekend to attend the summit, and thanks to the volunteers who worked hard throughout the year to help make it happen. See the FABB Flickr pool for photos from the summit. Blog accounts of the summit from Rootchopper and tinlizzieridesagain. Summit tweets at #ffxbikesummit. 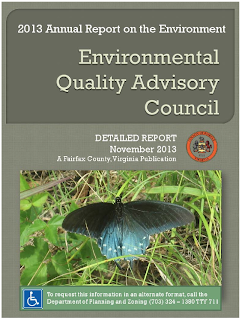 2013 Fairfax Bike Summit Program - A huge thanks to Tina Myers for donating her time to lay out the summit program. WTOP report on the Summit, Virginia cyclists push for friendlier bike conditions. Connection article Bicyclers Take Aim at Tysons: Cycling summit examines Tysons Corner accessibility. Nearly 160 people are registered for the second Fairfax Bike Summit to be held tomorrow morning, starting with a ride from Tysons to Mason that leaves at 8 a.m. and the advocacy workshop at 9 a.m. Online registration is closed but we have some space for walk-on registrations tomorrow. The weather looks good for those who are riding to the event. We'll have bike valet parking inside and temporary bike racks outside. See the Summit page for other transportation info. We'll report on highlights from the Summit after the event. You can check the summit hashtag #ffxbikesummit during the event to hear the latest news.